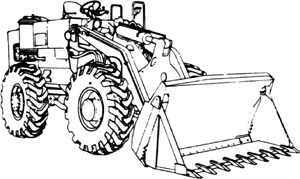 An excavator consisting of an articulated bucket mounted on a series of movable arms at the front of a crawler or rubber-tired tractor. 1. A bucket and lift-arm assembly designed for use on the front of a tractor; hydraulic cylinders, which raise and lower the lift arms, tip the bucket so that it may be dumped in the elevated position. 2. The entire machine using the above assembly. As an initial matter, we agree that Subpart 23-9 of the Code, which applies to "power-operated heavy equipment or machinery used in construction" extends to a front-end loader being used to construct a drainage pipeline. Why, just starting out, would you want to buy a $30,000 or $40,000 tractor when you can buy two H tractors, front-end loader, winch, 3-point hitch and several mounted implements for around $7,000? Weidemann's portfolio includes a line of compact wheel loaders, teleloaders and its flagship machines, the Hoftrac branded front-end loaders. Each day she and her front-end loader fill up two or three or sometimes ever four transfer trailers, each holding 60,000 pounds of solid waste. Following the grader is a front-end loader fitted with a 14-ft long blade. The worker was using a tractor and front-end loader to load hay bales onto the trailer. The tractor, a Massey Ferguson 1547 model, is equipped with a 47 horsepower diesel engine, hydrostatic transmission and matching front-end loader. In Syria near Dayr Az Zawr, three strikes struck an IS gas and oil separation plant and destroyed an IS technical vehicle, an IS excavator, two IS front-end loaders and damaged a separate IS front-end loader, the announcement said. Waruzila to get a state contract for a front-end loader the two state officials owned. The 3E series tractors are available with the optional factory-installed model 305 front-end loader, which features a high 530 kg (1,168 lb) lift capacity. Wireless controls allow the operator to control the feed rate, stop the system and move the plant as required from the convenience of the excavator or front-end loader cab.